You can help the environment by minimizing greenhouse emissions. Now solar is more accessible than ever. One more interesting fact is that the cost of solar has reduced and solar technology has become an efficient alternative. One question you may hear from builders or installers if you’re considering solar for your newly constructed home is whether your home is solar ready. But what does it actually mean and what might require your attention before going solar? You should look at the efficiency of your home. Want to maximize solar savings at home? It’s wise to consider an energy audit before beginning the project. If you’re building a new home, you should make your home as energy-efficient as possible. However, energy audit at home isn’t necessary before going solar. It can help you know the options to minimize your energy consumption. As a result, you’ll save on the upfront cost of installing a solar panel system at home. Another thing that will save you money, in the long run, is to electrify your home by switching to electric heat and appliances. This way, you will cut down on your home fuel costs and install a large solar panel system to generate electricity for your home. You should consider the material, durability, and the structure of the roof. Does your roof require replacement in the next 5-10 years? It’s better to consider roofing before installing solar panels. Therefore, you can avoid the cost of uninstalling and reinstalling the panels down the line. In fact, the panels will extend the life of your roof by protecting them from the environmental elements. When it comes to installing solar, the roof structure plays a key role. If you want to install your system on the roof, you should take a look at the structure of your roof beforehand. Some roofing materials are really harder to install than others. For this reason, it might be hard to find an installer willing to do the job with harder roofing materials. If you’re building a new home and looking to go solar, it’s a good idea to avoid slate and cedar shingles like roofing materials. Both are more fragile in nature. Going solar in your home requires you to have an ample amount of space, especially if you utilize a lot of electricity for residential purposes. Are you looking to install solar systems like solar water heaters, etc. at your new construction? Just avoid things like skylights, vents, and dormers on the specific parts of the roof where you plan to place panels. But solar systems on the uninterrupted part of the roof are easier to install. You should consider your roof’s accessibility to uninterrupted sunlight. Does the sun shine on your roof throughout the day? If yes, then it’s a perfect candidate for the installation of solar panels. However, the shade on your roof or your property might impact on your system’s electricity production negatively. A little bit of shade may not be bad for going solar, depending on the direction the panels face. You should check whether the shade remains in the picture during peak energy production hours. You can use the latest technology like micro-inverters to maximize the production. You should know the current electric setup of your home. Do you own an older electrical system at home? Your solar installer might recommend an upgrade of the existing electric panel prior to installation. 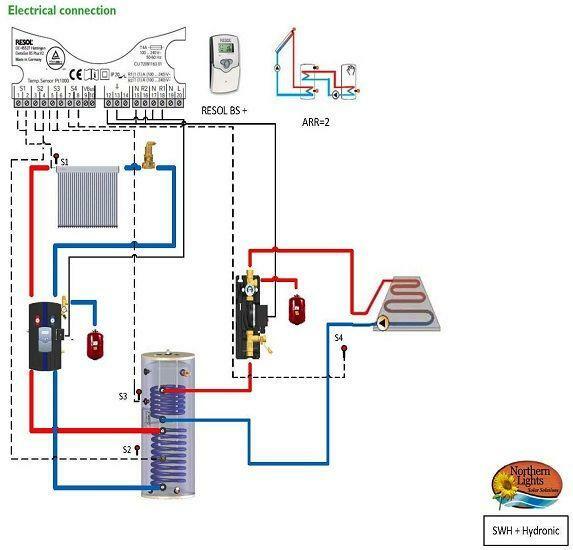 The inverter of the solar system will be connected to your electric breaker. Depending on the size of the inverter and your solar panels, you may require a larger electric setup for safety reasons. Now you may have an idea about how to make your home solar ready. What’s next? Are you interested in shopping solar kits for your newly-built home or an existing one? Shop for the best solar systems, including solar water heating systems at Solar Tubs today and take advantage of solar in the long run. Whether you want to buy a solar water heater or a solar pool heating system, you’ll find the right solution for your home at Solar Tubs! Before opting for solar water heating system installation, you must examine local building codes, subdivision covenants, zoning ordinances, and also any special regulations relating to the location. You’ll possibly require a building approval to set up a solar heating system onto your existing building. Not every municipality or community primarily welcomes domestic renewable energy setups. Though this is usually because of lack of knowledge or the newness of renewable energy systems, one should meet the existing building & permit processes to install their system. The subject of building code & zoning acquiescence for a solar system set up is usually a local issue. Even though a statewide building code is in effect, it is generally imposed locally by your county, city, or rural community. Installing the system too close to roads or lot boundaries. Special area codes like local community or homeowner’s association contracts also insist compliance. These contracts, historic district acts, and flood-plain supplies can easily be ignored. Shortly explain your designed construction, inquiring for other applicable codes or ordinances that might be in effect. Discover if there’re any extra local amendments to the acts in effect. Inquire how to make sure whether you’re situated in a historic province, flood-plain region or any special group controlled by a govt body. Read relevant sections of the acts, making copies of information you want to submit for future review & design/installation examination. Ask if they’ve any provisions, ordinances, or agreements that may have an impact on the design & installation of the solar water heating system. Cop & file relevant sections for reference. So, now you have the idea about building codes & regulations for solar water heating system! Now its time to take advantage of this ground breaking solution by ordering high-quality solar water heating kits & heater systems online from Northern Lights. Feel free to check out our complete Solar Hot Water Heating Package with built in Heat Exchanger and Back up Heating Element. A water heater is no doubt one of the costliest home appliances, and not to say, it needs a great deal of energy to run. Whether your water heater is electric or gas driven, it consumes about 75 percent of your utility bill, right? Regardless of how much you try to save on your utility bill, the result hardly changes. Again, you’ll find your everyday household life rather despondent without an appropriate source of hot water. In such scenarios, a solar driven water heater will be a decent option compared to a traditional fuel based one, particularly when you emphasize more on power savings. Let’s talk about 3 genuine pros of solar water heaters & we expect you will find some valid reasons to switch to the solar water heater at the end of the day. You don’t need much installation space for a solar water heating unit. You don’t need to find room for separate parts like conventional fuel-based water heaters. A tank-less system will also need less fitting space in comparison to the typical gas-driven water heater systems. Still, solar water heating units are more economical as far as installation space is concerned. Moreover, the thermal panels or PV are fitted on the rooftop. Investing in a solar water heater unit is a wise option if you’re disappointed with your utility bill at the end of the month. You must have an idea that solar water heating unit employs a renewable energy supply, sunlight, which is in plenty in the earth. More importantly, it’s absolutely free and you don’t have to concern about hefty utility bills every month. You must have an idea that the govt has been motivating people to use different renewable energy sources. Besides, they’re also giving many attractive schemes in renewable power sectors. Besides that, putting your money on a solar water heating system is one time, and it does not need several things except a few essential fittings. Furthermore, the cost of solar tools is reducing with each passing day, and several companies are providing more competent solar appliances at a reasonable cost. At the end of the day, you’ll certainly save some dollars for installation expense comparing to a standard water heater system. Moreover, solar heating units hardly need any maintenance, which eventually gives you big savings that you’d not have enjoyed with traditional water heating units. Buy solar water heaters from Northern Lights Solar Solutions and enjoy considerable savings. If you have any query about our solar water heating kits, please feel free to get in touch with us on 1 800 317 9054. To cut down your annual energy bills & carbon footprint installing a solar water heating system for your home is the best thing you can do. And now Government offering incentives to people that are installing renewable technology in their home, there couldn’t be a better time to getting one fitted in your home as well. Is your home suitable for installing a solar water heating system? A typical heating system needs a panel to be fixed to your roof to gather heat from the sun. To maximize the effect you require a 3-4m² area on a South-facing roof that gets direct sunlight for the most part of the day. A South-West and South-East facing roof can also be considered but won’t work as effectively. Flat plate or evacuated tube systems? Well, solar evacuated tubes are known to be more competent in covering sun rays into heat compared to flat plate panels. However, issues may arise during set up if they’ve not been correctly sized. Nevertheless, flat plate solar panels are an affordable substitute to evacuated tubes & are more suited for residential hot water use. Or you can use flat plate panels and solar evacuated tubes collectively. The flat plate warms the water first, then the evacuated tube further amplify the temperature prior to sending it to the storage container. Do you require planning approval for installing a solar water heating unit? In the United Kingdom, changes to authorized development consent for renewable technologies have made it really simpler to set up solar panels on residential properties without the need for planning approval. However, the special case does apply for conservation areas, listing buildings and areas of exceptional natural splendor. Regardless of where you’re, if you’re thinking about installing solar heating it’s recommended to check with your local authority if planning approval is needed before the installation process. Is your existing boiler compatible with solar water heating? The good thing is that most traditional boiler systems & hot water cylinder systems are compatible with solar heating. However, if you have a combination boiler that runs without a tank then it’s expected that it won’t be compatible. If you’re not sure it’s wise to consult a competent installer who can guide on compatibility with your existing system. Buy high-quality solar water heating systems from Northern Lights Solar Solutions whether you want to use it for residential or commercial purposes. Feel free to check out our complete solar package now! It is found that nearly 85% of the US energy supply is coming from fossil fuels like coal, oil and natural gas. Normally fossil fuels take millions of years to form, for which they are considered as the non-renewable source. Usage of fossil fuels affects the environment and the living beings due to the harmful emissions. In order to reduce the fossil fuel usage and decrease the pollution produced, we need to consider some effective ways like solar space heating and more. There are many consumer goods, which can be reused instead of being discarded. For instance, you can use a fabric grocery shopping bag instead of paper or plastic. Using reusable glass plates and cups also reduces the amount of Styrofoam and plastics (that require fossil fuel resources. While shopping, you can focus on buying post-consumer manufactured goods that are made from recycled materials. Having a fuel-efficient car proves to be an investment that saves on fossil fuel usage. To conserve energy and reduce fossil fuel consumption, you need to ensure proper engine maintenance. This will keep the car in top condition and reduce the fuel usage. By improving the energy performance of your house, you can reduce the heating loads and reduce the fossil fuel consumption. With a well insulated home, you can lower the costs for heating and air conditioning systems. Insulating your home will not only significantly boost the energy performance of your home but also helps in reducing the consumption of energy created by the fossil fuel. These days, most of the metropolitan cities and towns in the US are increasingly using clean energy for their mass transit systems. This gives you an opportunity to use the mass transit or public transportation, which will prove to be one of the best ways to reduce the consumption of fossil fuel. Apart from this, you can also organize a carpool or vanpool in your neighborhood to get the best results. In many cities, it is also found that people are opting for Eco-friendly means of transportation like cycling. Solar space heating systems are considered to be one of the most effective and excellent ways of reducing the fossil fuel consumption, carbon emission and costly energy bills. The solar heating systems use the green, clean and renewable- solar energy, which helps in reducing the consumption of propane, oil and other fossil fuels. Powered by the renewable energy source-sun energy, the solar heaters eliminate the pollution and reduce the amount of fossil fuel needed to power your home. Installing the solar heating systems will prove to be the most valuable investment for your home. If you want to know more about the best quality, well designed and high-performance solar space heating systems, then please browse through this webpage: https://www.solartubs.com/solar-home-heating.html! Warm pool water gives an excellent retreat to tired body and mind. People can now enjoy it for an extended period without the risk of added utility bill and carbon emission. A large number of pool owners are now installing solar pool heating systems only to feel happy using their pool more often they like because free sun light is available to heat up the cold pool water to make it comfortable and relaxing for their swimming throughout the year. The cost of pool heating may be high with use of any conventional pool heaters but now pool owners have the option of solar pool heating to enjoy a warm pool with the free and clear energy of the sun for a reasonable investment. With the availability of solar pool heating system in different sizes and prices, they can easily extend their swim season and save money on solar pool heating cost. The operational mechanism of Solar pool heating is very simple. Pool water is pumped and travels through PVC pipes to ultimately reach and get heated with energy trapped in solar collectors – basically arranged either in a series of collector tubes (conventional strip solar systems for reliable heating) or versatile solar panels – that are placed on ground, rack or roof of the house. As the pool water keeps running through the solar collector it continues to get heated with the energy of sun. The already heated water then goes back to the pool through the open motor valve. The heating performance of solar heating system can get controlled manually as well as automatically. Most of today’s systems have a digital controller to automatically review the temperature condition outside and direct water to the system installed on roof or ground . And, of course, this automatic control works on foggy and cloudy days – even though with reduced heating effect. Solar pool heating ensures continuous warmth to the pool water beyond cold season, and allows users to extend their swim season into the spring fall and autumn effectively. Solar heating is a natural and eco-friendly way to heat up the pool water – be it is an outdoor, indoor or inground pool. Moreover, it won’t deplete the ozone layer with carbon emission, because it is non-polluting, has low operational cost and can help users earn attractive incentives and rebates for use of green energy. What Factors Influence the Performance of Solar Pool Heating Systems? The actual rise in pool water temperature will rely on several factors. The most important one among them is the size of the solar collector or its glazing area – otherwise, the m2/watt capacity of the solar collectors that indicates solar radiation power of the heating system to feed the pool. And other factors in the list are solar collector pitch, orientation, roof type on which the solar pool heater will be mounted and the amount of wind and shade affecting the pool. You will have to consider all the above factors in order to get optimal performance from solar pool heating. The exact position and size of the solar collectors are needed to be calculated. Though roof is the commonly chosen place for mounting solar pool heating, you will have to pick up a location that gives the best sun exposure, tilt angle and orientation that are crucial for the solar pool heater’s performance. Solartubs is a solar products manufacturer dealing in different kinds of integrated solar pool heaters. You can work with its expert professionals and build a fully effective solar pool heating for your pool. For designing and developing a perfect solar pool heating system, Solartubs can be contacted at 1 -800 -317 -9054. In the current scenario, when energy expenses are rising & climate variation is evident, taking appropriate step to become self-sufficient and generate your own power is an excellent way of encountering both issues. A wise way of achieving this goal is to install a solar water heating unit and produce your own energy from the heat of the sun. Apart from offering long-term savings on power bills, homes installed with a water heating system have considerably decreased carbon footprints. The method of converting sunlight into power doesn’t discharge carbon dioxide or other toxins injurious to the atmosphere, making solar heating a clean & green renewable energy system. Whether your application is commercial, industrial or residential, Enerworks can provide a properly sized integrated solar heating system designed & optimized to meet your energy requirements. The company offers a wide range of solar heating stuff, encompassing solar pool heating, ideal for applications in all weathers. Silicon Solar carry a massive collection of the industry’s best solar panels & solar modules. They also carry a wide range of pre-packaged comprehensive solar heating units to get solar energy without any considerable effort. Their Flat Plate Solar Collectors are ideal for just about any solar water heating applications. And their Hot2O Solar Water Heaters are perfect if you’re living in a climate where freezing & snow accumulation isn’t an issue. Apricus, a leading Canadian solar kit supplier provides 2 kinds of solar collectors for use solar water heating units. Evacuated Tube Collectors unite the high-end performance of evacuated tubes with quick heat transfer ability of heat pipes to offer a collector that can run competently in nearly any weather offering hot water for domestic or industrial solar water heating projects. At the same time, Flat Plate Collectors provide a dependable source of solar hot water for domestic & commercial applications where evacuated tubes may not be appropriate. Northern Lights is a Winnipeg-based manufacturer and supplier of quality solar water heating systems. Their solar water heating systems work flawlessly by integrating with the best components out there in the market to offer you with the highest returns on your investment. The solar water heaters offered by them can be combined with pool heaters or space heating to make the most of your investment. All of their systems avail with Smartphone integration so that the users can see their savings in real time. Green energy is always found to be the clean energy. No doubt, all manufacturers will claim their products to be the best. However, it all comes down to you to make the final decision. Do some research over the Internet and you may settle with the best option out there. Prior to you purchase and set up a solar water heating unit, you first need to take into account your location’s solar supply, and also the most favorable orientation & tilt of your solar collector. The design and efficiency of a solar water heating unit relies upon how much sun’s energy reaches your building location. Solar water heaters employ both direct & distributed solar radiation. Even though you are not living in a climate that is sunny and warm, most of the time your location still might have sufficient solar supply. If your building location feature unshaded areas and usually south-faced, it is a great candidate for solar water heaters. Your local solar system installer or provider can do solar site investigation. Both the orientation & tilt of the collector will have an effect on the performance of your solar water heating system. Your contractor must take into account both the aspects while assessing your site’s solar supply & sizing your system. Solar hot water collectors or panels must be geographically oriented to exploit the amount of regular & seasonal solar power that they get. Usually, the most favorable orientation for a solar-panel in the northern geographic region is true south. Nevertheless, latest studies have established that, relying on your site & collector tilt, your panel can face about 90º west or east of true south with no significant decreasing in its performance. You will also wish to take into account aspects like roof orientation, local climate conditions and local landscape features that shade the panel regularly or seasonally, as these aspects may have an impact on your collector’s optimum orientation. These days, a majority of solar water-heating collectors are ascended flat on the roof. This’s more visually pleasing compared to rack-mounted collectors, which stick on the roof at very odd angles. Therefore, most collectors feature the same tilt as the roof. Though the most favorable tilt angle for your solar collector is an angle equal to your latitude, fitting your collector flat on an angled roof won’t upshot in a considerable reduction in terms of system performance. However, you will wish to consider roof angle into account while sizing your system. Buy solar water heaters and supplies from Northern Lights and enjoy considerable saving. For more information, don’t be hesitated to call us 1 -800 -317 -9054 or e-mail us at info@solartubs.com.